Horizon Zero Dawn’s captivating story remains one of gaming’s most memorable in recent years. Furthermore, Aloy is an incredibly characterized protagonist. Yet, beyond story and character, there exists another facet of Guerrilla’s modern classic that warrants praise—gameplay. At the nexus of said gameplay is the bow and arrow, which can be described as nothing short of satisfying. To uncover just what makes Horizon’s bow feel so good to use, Polygon reached out to Guerrilla Games. 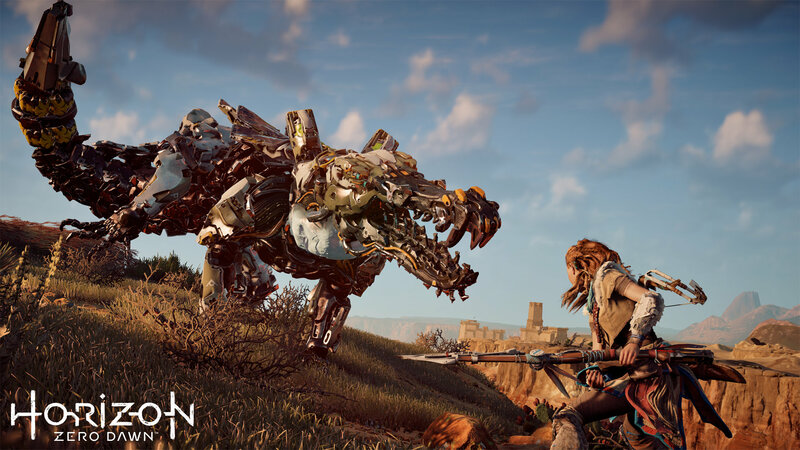 In the video below, Horizon’s Principal Sound Designer, Anton Woldhek, and Director Mathijs de Jonge breakdown the sound and gameplay mechanics behind Aloy’s weapon. Sound seems to rest at the heart of what works best with the bow. When an armor piece deflects an arrow, the sound feedback is that of a dull thump, explained Woldhek. Meanwhile, if the arrow damages a machine’s armor, the player is informed both visually and audibly. Sound factors into the enjoyment of using the bow in another way, as well. Quick firing doesn’t feel as good, but stretching the string to full extension makes for a pleasing experience. Giving the player “the right feel at the right time” pushes them to use the bow as Guerrilla intends. Woldhek added that the goal was to ensure players “naturally” pull the string “until the sound is good.” It’s an interesting shorthand for gameplay, as Guerrilla doesn’t have to place instructions on the screen about how best to use the bow. The sound design does the work for them. Another aspect of the bow that received emphasis is the trail an arrow leaves behind when fired. Speaking on Aloy’s bow and its visual appeal, de Jonge also stressed the importance of each machine’s detachable armor pieces. Seeing the pieces hurtling through the air gives the player the satisfaction of knowing that they’re doing something right, which is essential. Without the feedback loop of watching arrow trails and seeing armor pieces dismantled, keeping track of small arrows versus massive machines isn’t feasible. These small touches all work in tandem to make Horizon Zero Dawn’s gameplay a unique experience. They’re quality of life additions that aren’t necessarily required, but certainly feel imperative. We can only guess at what other aspects of gameplay received this delicate attention to detail.